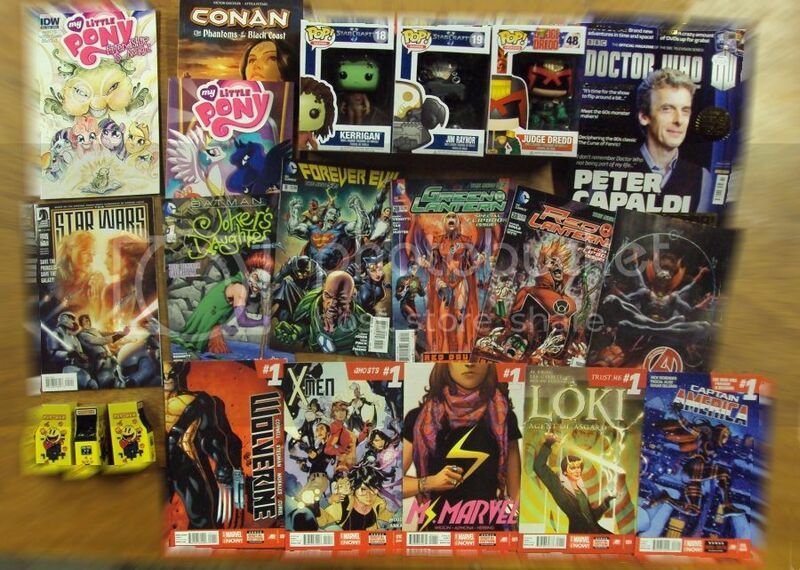 Cool Stuff 02/04 Lots of jumping on points for comics! Posted: Wed Feb 05, 2014 9:29 am Post subject: Cool Stuff 02/04 Lots of jumping on points for comics! This is a great week to jump on a series if you're interested in a certain title. DC has one, er, two.....er, ok, it's a flip book featuring Green Lantern AND Red Lantern. They also have Batman Black/White which is a series of short stories featuring the Dark Knight and premiering this week is Joker's Daughter #1. Over at Marvel, their series continue, but with a big #1 on the titles that are starting new stories like Captain America and X-Men. For actual #1's, there's Loki: Agent of Asgard, Ms. Marvel and Wolverine. For Independent companies, THE Star Wars is starting to wrap up, Conan: Phantoms of the Black Coast, a new Doctor Who magazine issue featuring the new Doctor and there's another My Little Pony issue! For toys and such, we received some very cool POP! figures for Starcraft and Judge Dredd and super cool Pac-Man mini arcade games with candy inside! So quit paying retail and come on down to get 10% off!